I hope all is well in your part of the universe. The tune I bring you today was the final piece of a puzzle that ended abut 20 years of confusion. Back in the olden days, when there were no internets to speak of and we all had to rely on record guides, fanzines and whatever first-hand/old-time stuff we could lay our hands on, we often had to rely on (often faulty) word of mouth when it came to researching music. I remember picking up a 45 by Tony’s Tygers called ‘Little By Little’, and making the assumption that whatI had was a recording by the early Hunt and Tony Sales (sons of Soupy) band. I labored under this assumption for a long, long time. Then, a few years back I saw the 45 you see before you on a friend’s sales list, picked it up on his recommendation and dug it. Though it was very poppy, seemingly rising from the conventional end of things, there was enough sonic coolness to pique my interest. 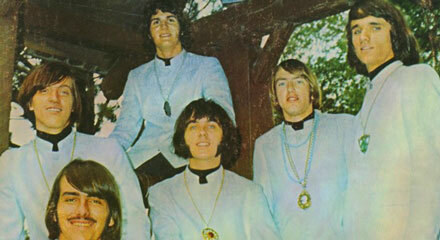 First, these Tygers were the same band as Tony’s Tygers. Second, they had nothing to do with the Sales brothers, having come from Milwaukee, Wisconsin. 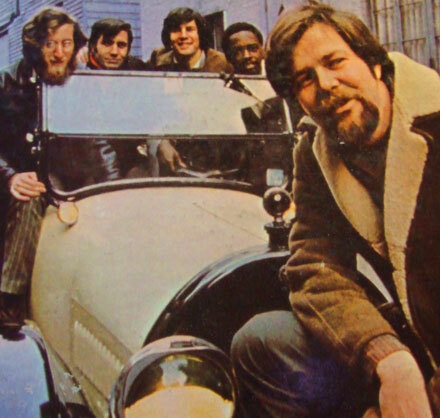 As it turns out, these Tygers (who competed locally with another band called the Tigers) recorded a handful of 45s and an LP for the local Teen Town label, before ‘Little By Little’ started to generate enough heat that A&M picked it up and re-released it nationally. The vibe here is leaning in the direction of bubblegummy AM radio pop, yet seems to be drawing from the same stew of UK power pop, like the Who and the Move that their slightly southern neighbors the Choir were working with. There are times where the Tygers sound to me like the New Colony Six evolving from their earlier garage sound to their pop years. Tony’s Tygers’ A&M deal didn’t go past that one single, but they continued to record and release stuff for Teen Town all the way to 1971. Following the break up of the Tygers, Tony Dancy would move west and go on to write songs for Hanna-Barbera cartoon shows. I come to you today to bend your ear (eyes?) about one of my personal favorites, the mighty Dave Van Ronk. If you know Van Ronk, it is probably by his presence in the New York folk scene of the 50s and 60s, where he was a master of acoustic blues and just about anything else he set his mind to. Van Ronk (pause here to read his great autobiography ‘The Mayor of MacDougal Street’) was a musical polymath, starting out (and occasionally finding his way back to) trad jazz, acoustic blues, Brecht and Weill, and – as you’ll hear today – genuinely interesting 60s rock. I first encountered Van Ronk back in 1976 or 77 when I saw him perform in a televised memorial concert for Phil Ochs. I remember my father having some passing knowledge and appreciation for Van Ronk, and over the ensuing decades I dug as deeply into his oeuvre as the depth of my pockets and the availability if his records allowed. It wasn’t until the early 90s, when a career-encompassing anthology called ‘A Chrestomathy’ was released that I had any idea that he had ever departed from the folk blues for which he was best known. I can recall vividly the way by brow arched when in the middle of the first CD the music moved from a traditional ballad to a truly demented/inspired cover of the Hollywood Argyles’ ‘Alley Oop’. ‘What is this?’I wondered as I grabbed for the liner notes. There wasn’t much there except a mention of a few of the tracks having been recorded by a group called ‘Dave Van Ronk and the Hudson Dusters’. There was no information out there on the group, and I figured I’d have to be happy with what I had on he comp, until I happened upon a copy of the group’s 1967 Verve LP at a record show. I was thrilled until I saw the price tag (I seem to remember that it was well over $50.00, a lot more than I could afford), so I passed on it, and – as these things often play out – didn’t see another copy for almost 20 years. Fortunately, when I finally did get the album it was around ten bucks (with the growth of the internet and Ebay shaking all kinds of obscurities out into the light). Extra-double-fortunately when I got to listen to/digimatize the whole record I was very happy to discover that it was not only as good as the tracks I’d heard, but better. 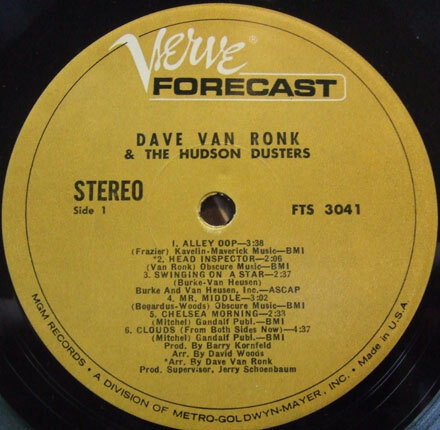 ‘Dave Van Ronk and the Hudson Dusters’ is that rare beast, in which an artists steps outside of their familiar sound and instead of stepping in a steaming pile, actually does something interesting. 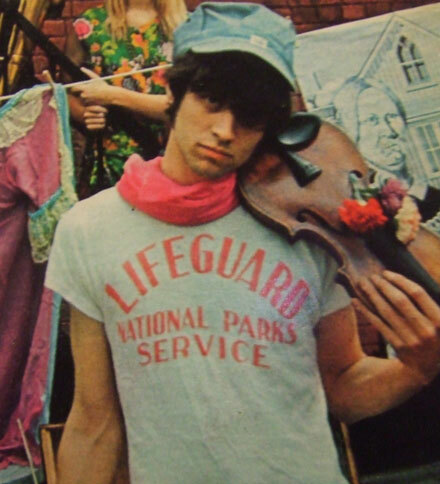 Though the sounds on the album are generally reminiscent of a certain New York freak scene early days vibe, i.e. electric Dylan, Fugs, Blues Project etc, it’s all mixed in with Van Ronk’s mighty voice and an unusual and unique sensibility. The Hudson Dusters actually sound like a “band” (as opposed to a one-off dalliance). 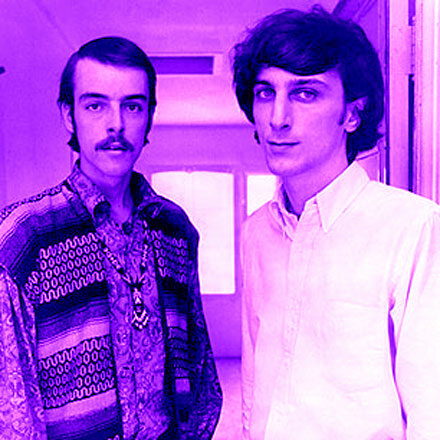 They were authentically weird, actually rock, and the songwriting (and the selection of cover material) is top notch. The three tracks I bring you today are representative of the album as a whole, including one of the two pre-fame Joni Mitchell covers, my favorite original ‘Head Inspector’ and the aforementioned ‘Alley Oop’. Van Ronk was an acquaintance of Mitchell’s in her early days, and his treatment of her songs ‘Clouds (From Both Sides Now)’ and ‘Chelsea Morning’ (two of the earliest recordings of those songs) manage to do them justice while giving them an interesting, Van Ronk-esque interpretations. ‘Clouds’ is especially poignant when you contrast Van Ronk’s delivery with the crystalline renditions by Mitchell and Judy Collins. ‘Head Inspector’ is a fantastic slice of New York freak folk rock, with ringing guitars and a solid rhythm section. There are even times where it wanders (deliberately, perhaps?) into garagey territory. It is the best of the record’s (mostly excellent) original material. The Hudson Dusters take on ‘Alley Oop’ still makes my ears perk up every time I play it. Here Van Ronk and band take on the 1960 Hollywood Argyles (actually a Kim Fowley/Gary Paxton studio concoction) is demented in every possible positive interpretation of that word. It opens with a slightly dissonant guitar riff, before the combo organ, bass and drums come in. The backing vocals arefairly conventional, but end up sounding weird when Van Ronk drops in with his delivery, sounding like a streetcorner preacher on a bender. The Hudson Dusters manage to take the novelty tune and turn into into something inspired. It’s one of my favorite records of the era. Unfortunately, the Hudson Dusters record has not been reissued. The band’s 45s and the LP aren’t terribly expensive these days, so if you dig what you hear (here) grab yourself the whole platter. I hope you dig the sounds, and I’ll see you all on Monday. I know I said last week that I would be posting some Dave Van Ronk stuff this week, but I forgot that I already had this month’s podcast in the can, so Dave and his pals will be along next week. This month, the Iron Leg Radio Show is dedicated completely to instrumental covers of 60s pop and rock tunes from all ends of the instro spectrum. There are jazzers, easy listening, Moog, pop orchestras, you name it, there’s something here for everyone. It is a groovy collection, and I hope you dig it. The tune I bring you today is one of those odd points on the line where a pejorative prophecy of sorts is fulfilled. Those of you that are not deeply into the world of 60s/70s singer-songwriter sounds, or lack a grasp on the Village folk scene of the 60s may not know the name Eric Andersen. I would however venture a guess that you have heard some of his songs. Back in the day, when he was one of the many ‘new Dylans’ (the prophecy referred to above) he penned some truly remarkable tunes, including ‘Violets of Dawn’, ‘Thirsty Boots’ and ‘Close the Door Lightly’. Eric Andersen was a talented singer and writer who also happened to have movie star good looks. Unfortunately, the 1960s was an era packed so tightly with talent and charisma that sometimes even those with all of the right moves didn’t make it all the way to ‘star’. 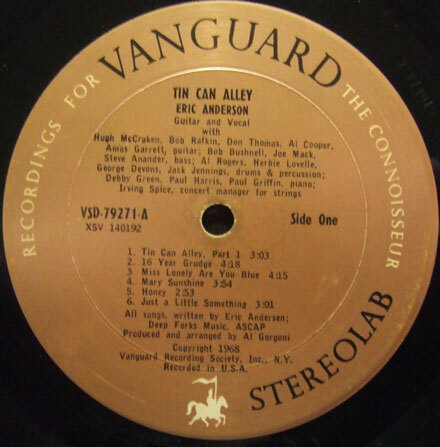 That Andersen – who has been recording steadily since 1965 – was branded one of the many ‘new Dylans’ (which I referred to as pejorative since the title ended up as an albatross around many necks during the 60s and 70s) isn’t surprising, but his 1968 LP ‘Tin Can Alley’ didn’t do anything to shake it off. He had already electrified his sound the previous year with ‘’Bout Changes and Things Take 2’ (which was, oddly enough, an electrified re-recording of 1966’s ‘Bout Changes and Things’), but ‘Tin Can Alley’ really pushes into ‘electrified Dylan’ territory. This is not to say that the album is bad (it’s pretty good) but rather that you look back wishing that some artists had taken the counterintuitive tack and not locked into what seemed like the obvious groove. ‘Honey’, recorded with a who’s who of NY studio heads (including Al Kooper) is a line drive right down the main street of Dylan-town, sounding like a slightly more energetic ‘Highway 61’ outtake. 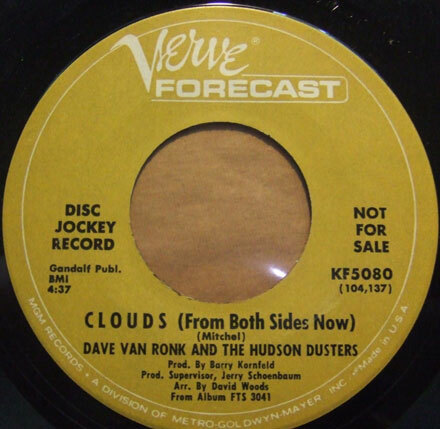 For something a little more ambitious and interesting, stay tuned for next week’s look at Dave Van Ronk and the Hudson Dusters. The two tunes I bring you today can be filed as ‘familiar sounds from an unfamiliar source’. Both of these songs are better known via their recording by other groups, but here they are presented by their authors, Michael Brewer and Tom Shipley. Brewer and Shipley are themselves better known by their later recordings, like their 1971 hit ‘One Toke Over the Line’. The two musicians had been bouncing around the LA scene in the mid-60s, writing and recording prior to their better known partnership. They had composed (by themselves or as a pair) songs for the Nitty Gritty Dirt Band, the Byrds, Noel Harrison, the Poor, Glenn Yarbrough, HP Lovecraft and the Garden Club (basically a duet between Shipley and Ruthann Friedman). I first heard ‘Truly Right’ on the Nitty Gritty Dirt Band’s 1967 ‘Ricochet’ LP which also featured a couple of very early songs written by Jackson Browne. It quickly became a favorite (the group’s first two LPs are lost classics of mid-60s LA) but it was a while before I figured out that the composers of the song were THE Brewer & Shipley. That same year, the Poor, featuring a young Randy Meisner, would record Shipley’s song ‘She’s Got the Time (She’s Got the Changes)’, one of the finest bits of Sunset Strip popsike ever made. 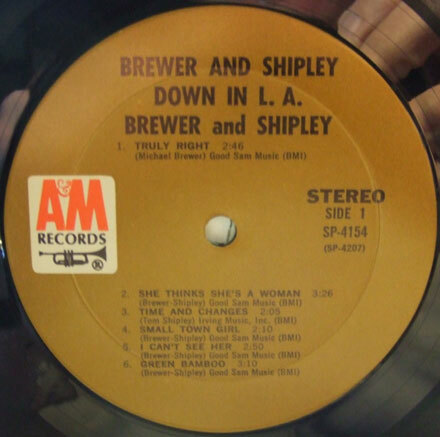 Flash forward a few years and I find out that Brewer and Shipley recorded their own LP in 1968 entitled’Down In LA’ and that it included their versions of the two songs mentioned above. The approach is much more relaxed/Laurel Canyon hippy than the harder edged pop of the NGDB and the Poor. ‘Truly Right’, which opens with acoustic guitar gains speed gradually, with the bass and drums coming in a bit at a time, until the whole band is moving along (with some groovy electric piano – courtesy of Leon Russell – running underneath). Brewer and Shipley lay down some very nice harmonies. ‘Time and Changes’ (truncated title, same song) is taken at a mellower, less popsike pace than the Poor’s version, but the overall effect is excellent. As much as I love the Poor 45, the Brewer and Shipley version has that late-60s, LA harmony vibe that reminds me of some of the cooler CSNY tracks. If you can get your hands on the ‘Down In LA’ album, grab it because it expands on the vibe, working in a little bit of country rock, all the songs presented by B&S’s great harmonies. Oddly, by the time ‘Down In LA’ was released, Brewer and Shipley had departed from the coast and relocated to Kansas City, MO. They went on to have a hit with ‘One Toke Over the Line’ and its LP ‘Tarkio’ in 1971.